Demonstrating our engineering genius, we were commissioned by an industry partner to develop a key promotional piece for the Marc Jacobs ‘Dot’ Eau de Perfum campaign. 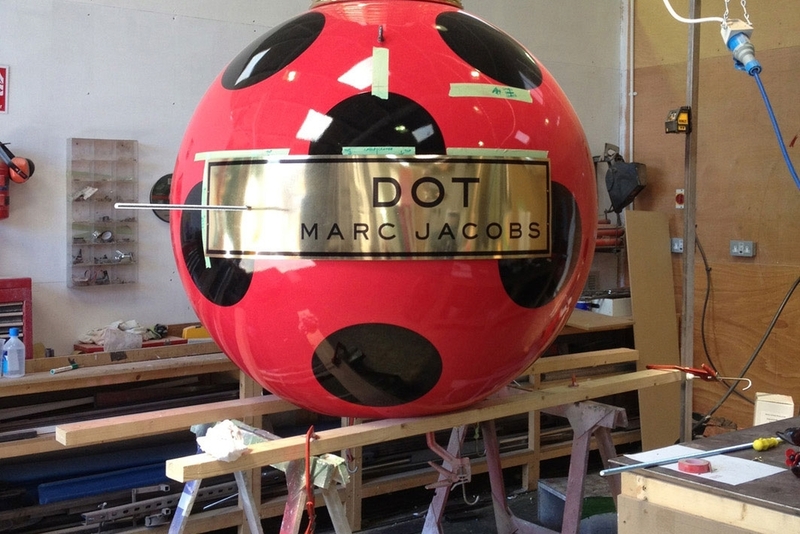 The concept was to build, suspend and install a giant replica of the Marc Jacobs perfume bottle for one of the UK’s most prestigious shopping destinations. The outcome, which was fully designed, engineered and manufactured by Propability was so successful that it was refurbished one year later to advertise the launch of the Marc Jacobs ‘Honey’ Eau de Perfum campaign. Tasked with developing all technical drawings, structural engineer reports, the build and manufacture in our workshop - as well installation - Propability brought vision to life. We created a 3m x 1.5m 3D fibreglass perfume bottle with formed acrylic wings weighing a total 200kg. It was a perfect replica of the ‘Dot’ bottle and we were proud to achieve this within the time frame of only one month - from concept to install. Installation involved Propability suspending the piece from a very high ceiling in the centre of the Westfield Shopping Centre. On display throughout the 2012 Summer Olympics in London, it was essential that the framework was 100 percent structurally sound and that suspension points were guaranteed to stand up to vigorous health and safety requirements suitable for the huge footfall of shoppers.